The much-anticipated ENIAC is unveiled at the University of Pennsylvania. Considered the first fully electronic computer (as compared to electro-mechanical designs) ENIAC calculated 5,000 operations per second — 1,000 times faster than its contemporaries. 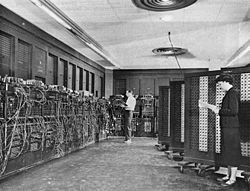 ENIAC occupied over 1,500 square feet of space, weighed 30 tons, and used 18,000 vacuum tubes. However, it couldn’t get YouTube.